It’s almost that time of the year again in college basketball, and those in Fairfax should be excited to see what the Patriots are capable of under second-year head coach Dave Paulsen. Last year was Paulsen’s first go-around as head honcho at George Mason, and though the Patriots finished the season 11-21 and failed to get past the first round of the Atlantic 10 Tournament, it was a slight improvement from 2014-15 where Paul Hewitt led his team to a 9-22 record and just 4 conference wins. The most notable accomplishment for the Patriots last season was their ability to beat solid opponents. George Mason took down Richmond twice, VCU, Davidson, Mississippi, and Oklahoma State. If it can find a way to beat all of the bottom-level teams with consistently, it could become a middle-of-the-pack competitor in the Atlantic 10. With a solid core of underclassmen leading the way, it seems George Mason has a solid foundation to build the future of its program on. Whether it be this year or in a few seasons, George Mason could really start to make a move in the right direction. The Patriots said goodbye to a few very important seniors in Shevon Thompson and Marko Gujanicic this past offseason. Thompson was 2nd in the nation in defensive rebounding percentage at 32.8% last season. He raked in 10.6 boards per game in 2015-16 and was an undeniable force on the glass. He was also the team’s third-leading scorer and a very effective shot blocker on the defensive end. Gujanicic was a key contributor, averaging 9.2 points and 6.5 boards per game last season. Needless to say, the Patriots lose a lot of depth and talent in their frontcourt. Patrick Holloway, Julian Royal, and Michael Rudy were all also seniors that have now graduated. George Mason doesn’t tend to add a lot of transfers, though that’s been the trend lately in college basketball. The Patriots do, however, have a solid incoming recruiting class that should see some court time next year. Kamari Newman, Justin Kier, and Ian Boyd are all 2 star guards that committed to Mason and could all see some minutes, unless they end up redshirting this season. Regardless, George Mason is building a core of backcourt players that will help Otis Livingston II and Jaire Grayer in the coming years. The Patriots’ highest ranked recruit in its 2016 recruiting class is 6-6 forward A.J. Wilson Jr. who should be called upon plenty this next season. The Patriots do not have much frontcourt depth and will need him and 6-8 freshman Troy Temara to help carry the load in the paint and scrape up some rebounds on both ends of the floor. Marquise Moore, despite being very limited last season, will be back and ready for his final year with George Mason. Along with rising sophomores Otis Livingston II and Jaire Grayer, George Mason should actually have one of the best backcourts in the conference. Livingston II was Mason’s best three point shooter last season at 35.4%, though the team lacked thoroughly in that category. The Patriots ranked 341st in the nation in shooting percentage from downtown at an abysmal 29.2%. The Patriots will either have to find a way to keep up with their opponents by scoring a lot of 2-point baskets or develop into a team that can knock down the great equalizer with some consistency. Jalen Jenkins and DeAndre Abram are two returning forwards that will have to take a step up this season. Jenkins is the team’s second best returning rebounder, and without Thompson or Gujanicic to clean up the glass, he’s going to have to stick his nose in the mix and really fight for his team. A poor shooting team like Mason relies heavily on second chance points, and Jenkins needs to be one of the guys to crash the offensive glass. Abram will only be a sophomore this season, meaning he has yet to reach his ceiling as a collegiate player. He had two consecutive breakout games last year where he dropped 24 and 27 points on Longwood and Wagner, both new career-highs for the freshman. If he can score like that on a more consistent basis, and against tougher opponents, he could emerge as one of Mason’s go-to-guys this year. George Mason has some good non-conference challenges this coming season, starting with a chance to play in the Gulf Coast Showcase. The Patriots will get a very good first round game against Houston, and if they beat the Cougars, they’ll have a very good shot at winning the whole thing. In addition, Northern Iowa, Mercer, and Penn State all present reasonable challenges for Paulsen’s squad. Considering the fact that some of the Patriots’ tougher games will be away from home, it wouldn’t be surprising to see them enter conference pay with a couple of understandable losses. George Mason doesn’t have a brutal conference drawing, as they’ll only have to play powerhouses in Davidson, Dayton, Rhode Island, and La Salle once. The Patriots will play George Washington, VCU, Saint Louis, Massachusetts, and Richmond twice in the conference season. This seems like a pretty favorable draw for this team, considering it was able to beat VCU once and Richmond twice last season. The Colonials could be of similar caliber as the Patriots, especially as they try to build a season with an interim head coach. 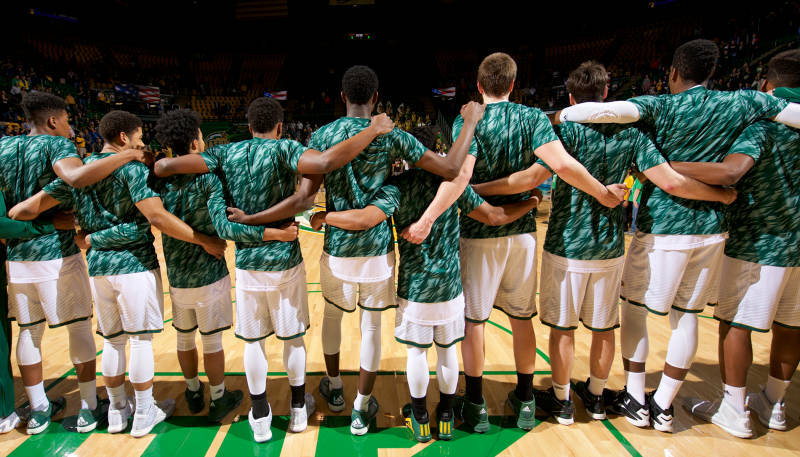 Games against teams like Saint Louis and Massachusetts will be key for the Patriots, as those teams will definitely be beatable for this George Mason team. George Mason will not be one of the best teams in the league this year, and they will not make the NCAA Tournament and likely not the NIT. At this point, this team has to get back to going .500 in a given season. The Patriots are definitely beginning to prove that they have talented players and vital pieces, it’s just a matter of putting them all together. It will be intriguing to see how Dave Paulsen does in his second year as Mason’s head coach. Does he manage to improve on last year’s record once more, or does George Mason fall flat with another disappointing season? At this point in time, a 15-16 win season would be a very good accomplishment for this team as it tries to rebuild. We’ve seen Mason take down some big opponents before, so you can never count the Patriots out. Follow us on Twitter, like us on Facebook, and check out our forum for more George Mason content.